If asked to choose my favorite condiment, information pills I may just have to go with hot sauce. Though mustard — especially the spicy, denture grainy kind of mustard — would be a very close second. When you’ve got the right hot sauce, online it can add subtle and delicious flavor, as well as heat. When you’ve got the wrong kind of hot sauce, it can taste vinegar-y or so overpoweringly spicy that you can’t taste anything else. 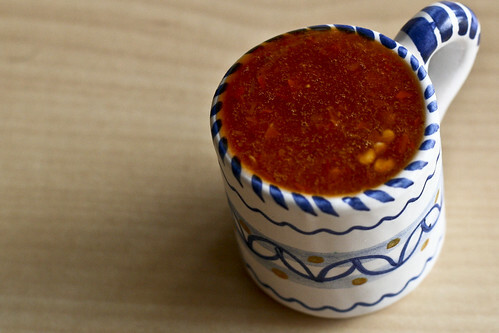 This homemade hot sauce has 4 ingredients: dried chiles de arbol, a touch of honey, a dash of apple cider vinegar and water. The chiles de arbol are spicy and smokey and give this hot sauce a unique flavor that has some of the chipotle’s smokiness, but isn’t as overpowering. And if asked to choose my favorite dish to dress with hot sauce, it would be eggs. Without a doubt, eggs and hot sauce are best friends. Last night, I made corn tostadas with refried beans and cheese, baked until crisp then topped with fried eggs, avocado, cilantro and hot sauce. Delicious and wholesome, it was a great way to kick off the week with a little spice. Apologies for the ugly picture. I had the wrong lens on my camera and was too hungry to notice. This sauce gets about a 7 in the heat scale, so don’t pour it on unless you like it hot. Remove the stems from the chile peppers, being careful not to lose the seeds in the process. Place the peppers in the bottom of a small sauce pan and toast them over medium heat for 2 minutes, or until they’re just fragrant. Cover with water and simmer for 5 – 10 minutes, until the peppers soften. Place the peppers and water, honey and vinegar in a blender and blend until smooth. Keeps in a sealed, refrigerated container for up to a month. Preheat the oven to 400°. Place the tortillas on a greased cookie sheet and bake for 5 minutes, or until they’re just beginning to crisp. Remove from oven, cover with refried beans and cheese, then return to oven for another 10 minutes, or until the cheese has melted and is beginning to brown. While the tostadas are baking, fry the eggs. 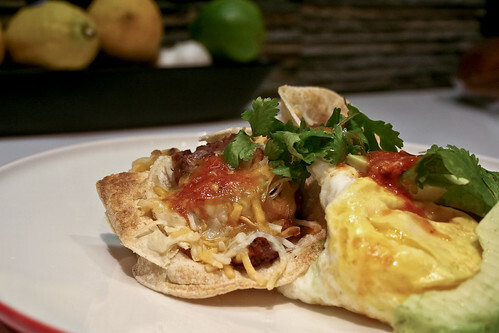 Assemble by stacking the tostadas, then the eggs, avocado, cilantro and hot sauce. Serve Immediately. This looks so good that I’m salivating at the thought of cooking it. I like trying different hot sauces, and I’ve discovered Tabasco is my least favorite. But, I’ve never made my own. This looks great; I have to try it! Oooh, in terms of condiments, it’s a toss up between hot sauce and giardinera mix! Hillary – What is Giardinaera mix?!?! Hello. Very first I wish to say that I definitely like your weblog, just determined it the past week but I’ve been following it constantly since then. Thank you for the great website and I hope you hold up the great work. If you do I will keep on to browse through it. Pingback: Cztery Twarze Sosu. | Powoli. Po Prostu.